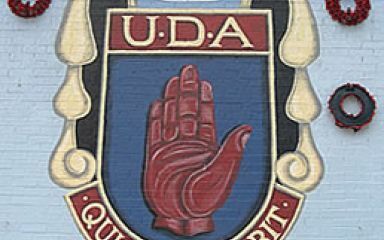 The Ulster Defence Association (UDA) was the largest loyalist paramilitary vigilante group in Northern Ireland. It used the name Ulster Freedom Fighters (UFF) when it wished to claim responsibility for attacks. The UDA's/UFF's declared goal was to defend Protestant loyalist areas and to combat Irish republicanism, particularly the Provisional IRA. In carrying out its defense of territories, the group frequently murdered Catholics as "retaliation" killings.VideoVideo: Documentary on the UDA's anti-IRA paramilitary campaign in the early 1990s that resulted in the IRA calling a ceasefire and admitting they could not force a single Irish state through terrorism. The UDA assassinated dozens of senior IRA and Sinn Fein members during this period - and helped to bring peace to Northern Ireland. Ulster Defence Association, also known as Ulster Freedom Force (UFF), Ulster Freedom Fighers (UFF), Ulster Young Militants, Wombles , Red Hand Defenders is an inactive group formed c. 1971.